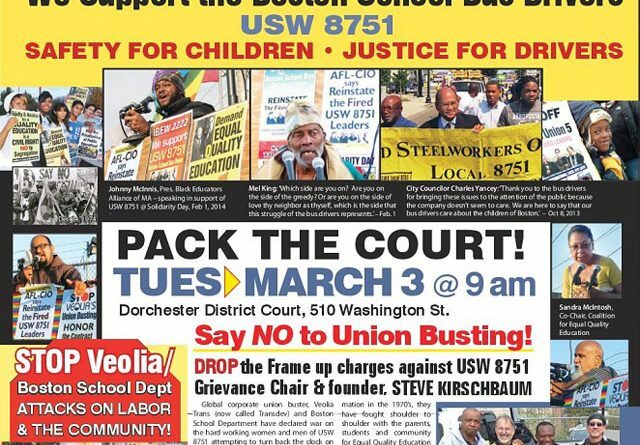 Be it resolved that the League stands in solidarity with the struggle of the Boston School Bus Drivers United Steelworkers Local 8751, a social activist union local, against the union-busting of the giant multinational Veolia Corporation and the collaboration of the city of Boston in this union busting effort. We demand the immediate rehiring with back pay of the four fired union leaders, and that the frame up charges against fired union leader Steven Kirshbaum be dropped immediately. We demand that Veolia Corporation stop stalling and negotiate a fair and just contract with the union. Brother Kirshbaum’s trial begins on March 3, 2015, and we call on member organizations of the League, unions in particular, to send protest letters to the judge and, where possible, to organize protests against the multinational Veolia Corp.